St. Joe's Prep celebrates after winning its fourth state title in the last six years. HERSHEY, Pa. — Jeremiah Trotter Jr. wore a relieved look on his face. This wasn’t supposed to be this hard. But it was — and it was good. It was a test of adversity that the young St. Joseph’s Prep Hawks bore the brunt of and overcame. For Trotter, the St. Joe Prep’s sophomore linebacker, he held close the special memory of what it was like when the Hawks’ seniors tearfully walked off the Hersheypark Stadium field for the final time last year and he didn’t want to relive that feeling again. So, Trotter, with an NFL Films camera crew covering his every step, played the best game of his young life on the biggest stage, leading the Hawks with 12 tackles, two solo tackles for nine yards in losses, and junior Anthony Rightley yanked in three interceptions in leading the Hawks to a 40-20 victory over Harrisburg in the PIAA 6A state championship to claim their fourth state title in six years. 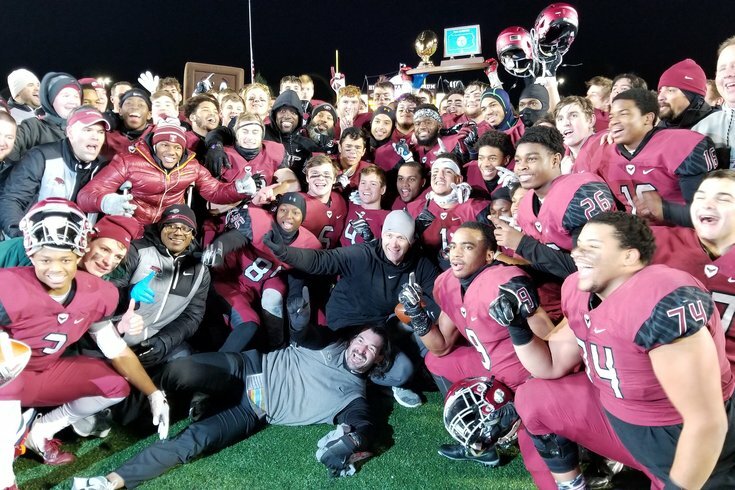 The Hawks, who finished the season 13-0, did it by overcoming the most adversity they ever had to win a state championship, rebounding from three lost fumbles, one pick-six, two missed extra points and a blocked field goal attempt to prevail. There were things in Trotter Jr. that he hadn’t shown on the field before. Basically, he played with a vengeance, with the same nasty edge his father, Jeremiah Trotter Sr., played with when he was an Eagle. “We had to trust each other to do our jobs and stay focused on doing what we needed to do,” said Trotter Jr., who will be the subject of an NFL Films piece on former NFL players and their sons who play football. “We never got down, even when they were scoring. “We had to stay together the whole game. I was playing for the love of my brothers, and yeah, I’ll admit it, I was angry. I was fighting for them. I didn’t want to let the seniors down. I wanted to win more for the seniors and I remember last year. This championship was certainly the toughest state title Hawks’ Gabe Infante and his crew won. The Hawks turned the ball over on their first two possessions in the first and second halves. They trailed, 7-0, and were slapped with eight penalties for 74 yards in the game, not to mention trying to corral Harrisburg’s dangerous quarterback, senior Kane Everson, who twisted and turned to find time and openings in the Hawks’ defense for 201 yards passing and a touchdown. “We’re resilient, we don’t go away, we battle and stay together,” Infante said. “We worked too hard to fold and the kids picked each other up. We had guys playing out of position. We overcame a tremendous of adversity. Our whole coaching staff did a masterful job, and they did it while facing an extreme amount of adversity. After fumbling away the first possession and throwing a pick-six on the second series, the Hawks then proceeded to score on their next four drives, giving them a 27-14 halftime lead. Hawks’ sophomore quarterback Kyle McCord was 16 of 23, with one interception, for 198 yards and two touchdowns over the first two quarters. Marques Mason played his omnipresent role for the Hawks as receiver, kick returner and running back, amassing 122 all-purpose yards by halftime. But the first half really was a case of fastbreak football — neither team was able to stop the other. By halftime, the teams had combined for 546 yards of total offense over 80 plays (St. Joe’s: 39-311, Harrisburg: 41-235), which averaged out to 6.8 yards a play. The Hawks were hurt by turnovers, Harrisburg was hurt almost every time St. Joe’s Prep didn’t turn the ball over. The Cougars’ Jai Burney scored on the pick-six, going 27 yards with 8:58 left in the first quarter. That came after Kolbe Burrell fumbled the ball away on the Hawks’ first series, which happened to be recovered by Burney and didn’t turn into anything. Burney was responsible for all four Prep turnovers, with the pick-six and three fumble recoveries. When the Hawks did keep the ball, they were simply too fast and too powerful for Harrisburg, scoring on drives of 53, 80, 71 and 59 yards. But the opening of the second half brought more of the same on the first two possessions. Another lost fumble produced a 25-yard TD pass from scrambling Everson to Donte Kent with 7:38 left in the third quarter. A second lost fumble on the second series of the third quarter was erased with 5:45 left in the third when the Hawks’ Anthony Leneghan recovered a Jahmir Plant fumble. The Hawks’ Marques Mason put the game away with a pair of fourth-quarter touchdowns, and the Hawks never allowed Harrisburg past the St. Joe’s 45 again in the last quarter. A telling stat: Harrisburg picked up only 72 yards and four first downs in the second half, while Prep finished with 509 yards of total offense (198 yards and nine first downs in the second half). With the foundation of this team comprised of sophomores and juniors, the chances are very high.